With a push towards healthier lifestyles all around us, we often forget about our environment at home. Often initial changes come with our nutrition and are closely followed by our physical and mental health. But our home can be a large part of our equation as well. 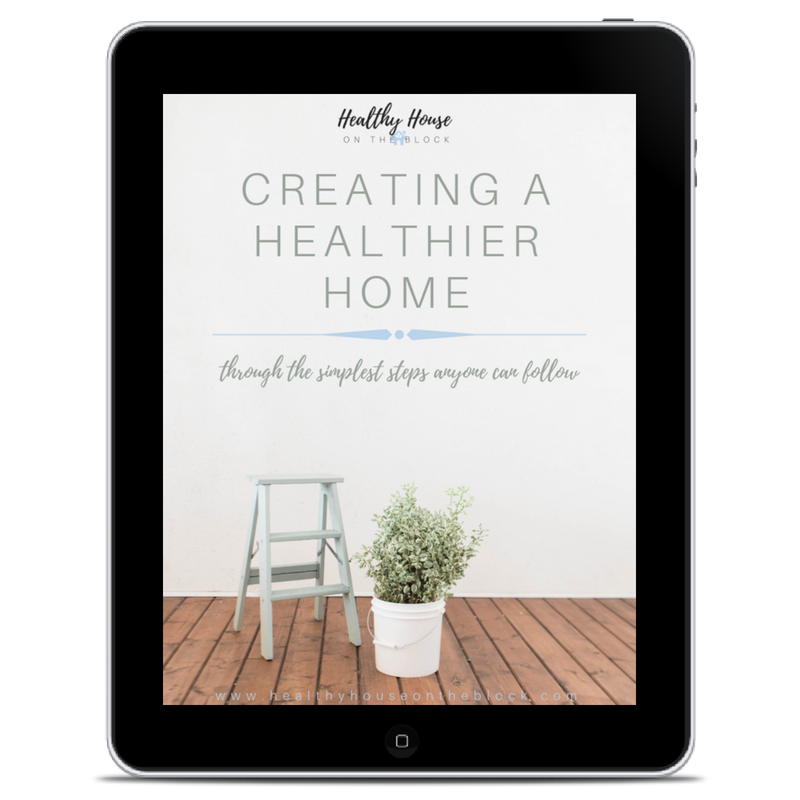 We can either create a home that promotes health and wellness, or we can create a home where toxins burden our bodies and prevent us from fully restoring to natural health. So often families are completely overwhelmed by the thought of changing their home and habits that they never even begin. These changes feel really big and like major lifestyle changes, when in truth, by breaking down the changes, it’s relatively simple. I’ve made some improvements to my own home and over time I’ve snowballed my changes. Using this tactic helps not only helps break your journey down into steps, but you start to gain momentum as you continue to improve your surroundings. I’m a planner at heart, which is just how I help my clients and homeowners. We break down creating a healthier home environment down into a few different categories and stages. To start, the biggest thing you can do to create a healthier home today is avoiding toxins you introduce to your home environment. I like to call this being the keeper of your home. Basically it boils down to the fact that YOU can control and limit what comes into your home in the first place. By doing this you’ll prevent problems before they take hold and become a hazard to your home. The final thing you can do with toxins is dilute the air inside. Obviously not all toxins can be removed from a house, and for that reason, dilution is key. By bringing in fresh air from outside, the polluted indoor air can be drastically improved. Through the steps below, you can begin to create your healthiest home. Open windows on a regular basis to naturally ventilate. Even in winter months, you can rotate through your home one room at a time to open the windows for 5-10 minutes. Run ceiling fans on a regular basis to push air throughout your room and home, circulating it to leaks and gaps near windows and corners. Run vented fans in the kitchen, bath and laundry to pull polluted air out of your home. Cleaning products and solvents often contain large amounts of chemicals and toxins that we add to our indoor air and spread around our indoor surfaces. These toxins can cause problems ranging from short term respiratory irritation to disruption of important hormones within our bodies. Studies have found that these chemicals are winding up in our house dust and staying inside our home for extremely long periods of time. One way to avoid these toxic cleaners is to remove what you have currently that rates poorly on Environmental Working Group’s website and replace them with safe alternatives. You can read all about safe alternatives to toxic cleaners in this post. You can also use my Ditch & Switch Worksheet page that will help you make a list of all the cleaners and products in your home you want to eventually change over to a safer alternative. By making a plan to create a toxin free home, you’ll be setting yourself up for REAL success and solid changes. Our shoes travel throughout many locations in just a single day. Think of the places you’ve walked through this week: school, work, public restrooms, grass with pesticides on it, etc. The list could go on and on. All that you walk through ends up on the bottom of your shoes and tracked into your home if you wear shoes through your house. Studies reveal that house dust actually contains trace amounts of pesticides, which are thought to be entering the home through our shoes and pets. For this reason, it’s best to implement a no-shoe policy in your home. Having a designated spot to leave your shoes when you enter the house is a simple way to remind your family and guests that shoes stay at the door. Humidity inside a home can fluctuate from season to season and even from time to time throughout just one day. There are a few reasons humidity at home should remain on the lower end of the spectrum. First, toxins and VOCs off gas at a much higher rate when humidity levels are high. Second, high humidity is an environment that promotes the growth of mold and mildew as well as reproduction of dust mites. Whichever reason you may choose, reducing your humidity levels to a level between 35% and 40% is ideal when it comes to the health of your home. You can find more tools and tips for reducing humidity in this post about the Perfect Humidity Levels. Plastics, especially in the kitchen and near food can be hazardous to the health of our bodies and our air. Pthalates (plasticizers) that are present in all plastics and are harmful to the endocrine system, nervous system and developmental parts of the brain as discussed in this overview by he CDC. When plastic is heated and warmed, it releases even more toxins into the air and into anything touching it such as food. This is why using glass, steel or other sustainable materials is so important. Going through your home and kitchen, take a glance to see just how many plastic items you own. Next, look at the number of items you could potentially change or swap next time you are looking to purchase new. Start a list of items you want to swap out in your own toxin free home and make the start to replacing toxic plastics. You can read more about how to Reduce Plastic in Your Home here and follow up with Six Ways to Easily Replace Plastic in Your Kitchen here. Synthetic fragrances refer to any product in your home that has added scents to it. Items generally range from personal care product to cleaning product to candles and air fresheners. Generally synthetic fragrances are made up of a variety of chemicals that are used to mask the smell of a product in the first place. Unfortunately, we often have no idea what make sup these synthetic fragrances as there is no legal requirement to disclose their make up to the public. Trade secret protects companies from having to release information about what chemicals and toxins are used to create their scents. As consumers, we must also be careful when we reading misleading packaging. Just because a product states it uses and oil or natural element, does not mean the product is truly healthy or safe. These terms are not regulated at all and can be open to interpretation. This is why checking your product on the Environmental Working Group website can help you understand exactly what is in a particular product and if it’s safe for your toxin free home. You can use my worksheet and read more about Where Synthetic Fragrances are Hiding In Your Home here. Dust is not only a nuisance, but as mentioned earlier, it also contains toxic particles from cleaners and pesticides. While dust is a natural part of even a toxin free home, it should be reduced as much as possible. This is especially true if you have young children in your home who play near the ground or who have poor hand to mouth habits. Dust can be ingested quite easily and each of the toxins present in the dust travels directly to the bloodstream. You can read all about how to get rid of dust and the specifics of how it affects your health in this post. How do I remove toxins from my home? (1) Make sure your home is properly ventilated by using your whole house fan and windows. (2) Reduce toxic chemicals in cleaning solutions by choosing safe and green options. (3) Implement a no-shoe policy to reduce toxins being tracked in. (4) Reduce humidity levels, and (5) Reduce plastic use. (6) Stop using synthetic fragrances for a toxin free home and opt for essential oils for scent instead. (7) Remove dust on a regular basis. Thanks for these great and easy ideas. We don’t wear shoes in the house because we lived overseas where it was considered dirty, so we got out of the habit of wearing them. I never considered that it was keeping pesticides out of our house by leaving shoes at the door! Great, comprehensive post. This would be a great guide to share with parents. Beautiful am definitely making use of this tips. A healthy house is very important and it aids a good lifestyle. That is such a genious tip to open one room at a time during the winter! Everytime there is a slighly warm day, I make sure to open up my home but I really could have been doing this all year round with your suggestion! You are so welcome!! I have done it consistently this winter and I feel like it’s made a world of difference! I’m so glad this was helpful! This is one of my favorite habits at my house. These are all things we are working on in our home! Some we have already implemented. I have never allowed shoes in my house, ever since my oldest was born because he was always on the floor, and especially when he started crawling and putting things in his mouth. I thought I knew a lot about toxin-free living, but this post has given me even more ideas! I never really thought about ventilation as something that would help with toxins, but it definitely makes sense (assuming the air outside is good, of course). I do love using essential oils in place of synthetic fragrances and other toxic ingredients. They are probably my favorite way to live with fewer toxins. I’m so glad this was helpful! We live in an area with clean outdoor air,so it makes sense for me. Yes! Essential oils have changed my life too! We try to do these things but… They never last very long. Properly venting the house is probably the number one most important thing, however, we live in LA and the air outside, not all that clean – LOL! I have moved to my new house last September and since then, I have implemented the no shoe policy. I must say, it’s still hard for me to tell my guests to remove their shoes. This is such an informative post! I do follow most of these steps to keep my home toxin-free 🙂 These days, I am working on reducing the usage of plastics. That’s so great! It can be a big project to reduce plastic and change habits. Nice work!! We’ve been working towards a toxin free home for a number of years – it is NOT am easy task!! But we’re mostly there, I like your idea of ventilation – definitely something we have to keep an eye on! You’re right, it can sometimes be a bigger task than we originally thought. Good for you, Marifaith! Found some excellent tips here. Proper ventilation is extremely important. And I think no shoe policy really helps. I’m so glad! You’re right…these are two of the best ways to help your house . I already knew that food and plastic are a no go, but I had no idea that warming plastic releases toxins into the air!! Reducing dust has been a constant struggle at home. But, I have recently gotten rid of so many synthetic fragrances around the house and replacing them with natural flowers or organic scents instead! 🙌Any little bit helps!! Dust is a tough one for me to get under control too. Ventilation is an important part of making sure the toxins get out of your home. It’s like a breath of fresh air. Even inspecting air conditioning units for mold is essential if you want to avoid toxins in the home. Omg so many great tips!!! Having a toxin free home is definitely something I wold like to accomplish! That’s awesome! Let me know if you have any questions or need any help, Courtney! These are some great ideas. Many I had not thought about before. Thank you so much for sharing these great tips! I am always looking for ways to make my environment cleaner in a natural way. Thank you so much for sharing!